Join us for a day of service learning as we soak in the history of Nashville's Fort Negley. Built entirely by African American soldiers during the Civil War, Fort Negley was a Union stronghold during the Battle of Nashville. 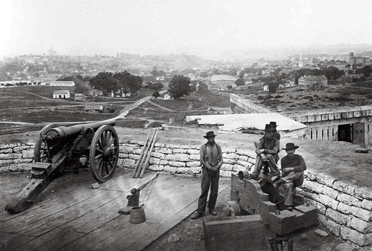 At the time of it's construction, Fort Negley was the largest inland military foritification in the entire country. Through a variety of primary sources, the Fort Negley Visitor's Center tells a comprehesive history of the fort's involvement in the war as well as it's 20th century significance. We'll have the opportunity to take part in a guided tour of the fort alongside knowledgable experts including a civil war historian from Vanderbilt University. At the conclusion of the tour we will help in a variety of service projects around the fort to ensure that our neighbors will be able to enjoy it for years to come! Kids: Open to all ages! Weather: This trip is drizzle or shine. In the event of severe inclement weather, the event will be rescheduled. Registration: Mandatory! Please click the link above to sign up!